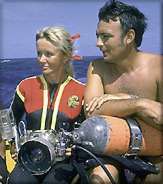 The Australian husband and wife team of Ron and Valerie Taylor has been at the forefront of the field of underwater image acquisition since the early sixties. They have provided footage for numerous television and film productions and are world renowned for their specialization in getting imagery of the shark in its native environment. Recently, they have adopted the use of DV cameras and decks as a compliment to their enormous catalog of professional film and analog video footage. What follows are Ron Taylor's remarks and insights, gleaned during a recent interview conducted by Charles Roberts and Jay Garbose. I have been interested in photography ever since I was at school in the late 1940s. My father was an amateur photographer and 8mm cameraman. When I took up the sport of spearfishing in 1951, I naturally wished to take underwater pictures, so I built an underwater housing for a still camera and started to get good results. When television came to Australia in 1956, I saw the potential for making underwater news stories. My lucky break came when a friend loaned me his Bell Howell 16mm movie camera. It used a 50 foot magazine that had a running time of just over a minute at 25 frames per second. I built a housing for it. My friend also bought the 16mm film for me to experiment with. I could not afford to buy movie film in those days because I was only an apprentice in the printing industry. When I learned to get the right exposure and color filters to produce a professional result, I purchased my own 16mm Bolex, made a housing and started selling news items to TV and Movietone News. My first TV documentary, SHARK HUNTERS, was sold to NBC in the US in the early 60s and I was on my way. I purchased my first 35mm movie camera in 1967, built a housing and started shooting underwater scenes for other peoples' productions. My first major 35mm shoot was for BLUE WATER WHITE DEATH, in 69. Peter Gimbel was producer, director and underwater cameraman. Jim Lipscome was the topside cameraman/director, while Stan Waterman and I were underwater cameramen. Stan and I worked as a pair as did Peter and Valerie. I had a close call during filming of Blue Water White Death. My 35mm camera had run out of film and I was sitting on top of the shark cage that was suspended about 30 feet underneath a dead Sperm Whale. Peter Gimbel, Stan Waterman and Valerie were still working with the hundred or so oceanic sharks that were feeding on the carcass. I was enjoying the spectacle when suddenly I received a hard blow to the side of my head. I didn't see the 9 foot Oceanic White Tip Shark coming. The blow almost knocked me unconscious. I could feel my body going limp and sea water was running into my mouth beside my mouthpiece. My vision was narrowing. Luckily, I regained control. The shark didn't try to bite me. It was simply an investigative bump. They often did that to the cages and even the Whale. I think they test to see if an object is edible. My most famous shoot was the underwater live Great White Shark sequences for JAWS. That came about when Universal Studios producers asked Peter Gimbel to shoot the underwater shark sequences. Peter said he would not shoot underwater, and instead offered to direct the movie. Steven Spielberg had already been engaged to direct, so Peter suggested they contact us here in Australia for the underwater sequences. They did and we jumped at the opportunity. Valerie and I became well known for shooting dramatic shark footage. We have supplied footage to most of the world's top producers. Perhaps our best known documentary sequences are in National Geographic's SHARKS. You may remember seeing Valerie testing the stainless steel mesh suit with Blue Sharks off the San Diego coast. Cinematographer Howard Hall was shooting slow motion 16mm while I was shooting normal speed 16mm. I consider Howard to be the world's top underwater cameraman. Howard has received many awards for his documentaries. Most of my film shooting has been with 16mm, although I also have a 35mm library. I purchased a 16MM-35MM six plate flat bed editing machine in 1975, and edited some of my own productions in 16mm. I also found it very useful for selecting 16 and 35mm footage for sale as stock footage. Then, in 1985, I built a housing for my first 8mm camcorder, which delivered the wonderful flexibility of low cost and long running time. The down side was low video quality. The arrival of Hi-8 Video finally produced quality acceptable for broadcast TV. And today, Digital Video is changing my professional life. The digital revolution has arrived. My film cameras never get used now, and what's more, their value has dropped dramatically. I now use 3 chip DVCAM units in housings I made myself. In the past year, three 52 minute documentaries entitled SHADOW OF THE SHARK have been produced featuring the adventures of Valerie and myself. Nearly all the footage came from my library. I was very interested to note that my recent PAL DV footage was equal, and sometimes better, in quality than some of my old 16mm film. Technically, film has higher detail resolution than DV. However, film has to go through a telecine to convert it to video for TV release. In my opinion, the telecine reduces film quality to about the same level as consumer DV, especially when you view the results on a home TV. I also have a Betacam SP edit suite and have had all my film stock transferred to tape. Editing and finishing on tape certainly beats the high costs of an all-film production. After the shoot, my first job is to go through my original camera tapes and select out all the best shots that I know can be used in the final edit. I transfer all these selected shots to a 3 hour DVCAM master tape. I have a Sony DSR30 PAL deck as the record deck and use the camcorder to transfer the original. My original tapes never get touched again. I also have the option of selecting those shots and capturing directly to the hard drive. At the moment, Final Cut Pro is very new to me. I am only in the beginning stages of using it but can already see the advantages of a non-linear editor. I hope to be able to do the complete postproduction in FCP. I will probably work the much same way I do with Betacam linear editing; that is, construct short sequences. What I really like about FCP is the Edit Decision List and Batch Capture features. I plan to use the EDL to select good takes while on location and then make batch captures back in the edit room. I can see the tremendous advantage of making several versions of an edit and to be able to easily make changes. In a couple of respects, video offers big advantages for underwater cinematography. First, it responds very well to low contrast lighting and makes the water look clearer than it actually is. Second, much less artificial light is needed to get a good colorful exposure. Where I would have to use a 650 watt light to get good color on film, a 100 watt light will achieve the same with video. Shooting underwater with video is easy; you can get near perfect exposures all the time. For best results, I use a video light to make the colors show up. The mini-arcs are best because they are daylight color temperature. I use a 3-chip camera, although single chips cameras are also good. You may gather that my hobby is making housings. When I was first starting up, I didn't have the money to purchase housings, so I had to make my own. I get great satisfaction when I make an underwater housing and it works the way I planned. I must say I am envious of some of the latest commercially produced housings, with electronic control of just about every function. My housings only have mechanical controls. On the other hand, they never fail. I have seen the others quit occasionally. Water coming in is the greatest risk. I have ruined two video camcorders in recent years, both times through my error in not checking seals. I am normally very careful but it is amazing how human error creeps in. I think my age has something to do with it. I'm 67 now. I never lost a movie camera in several thousand dives in earlier years. Charles Roberts AKA Chawla teaches Digital Video, Audio and Post Production at Fitchburg State College in Fitchburg, MA. He is a busy freelance shooter, editor, compositor and A/V and DV solutions consultant and installer. He is also a whacko video artist with an eye peeled for the incredible expressive possibilities of interactive DVD for the masses. He spends what little time is left serving as a Guide on the 2 Pop Final Cut Pro Discussion Boards.